For some reason the Topper Open meeting has been moved from its familiar September date to the spring - what feels like just a few weeks from the winter event. The date also clashed with umpteen other Topper events, and so the turnout was pretty desperate. Room for improvement there Topper Association! Anyway, in spite of what I think was the worst turnout for an Open meeting of any class at Island Barn that I can remember - fifteen years at least, the tiny fleet did deliver some cracking racing, and with clear air available to everyone there was always the potential to get to the front - at least if your name was Nancy Scott... For Nancy it was who found her way to the front of every race bar the 5th, in which the top 3 finished all but overlapped. With a small fleet of close matched competitors Mike was able to turn round the races rapidly, and manages to squeeze in three two lap races in the morning and another three in the afternoon, and still leave time for a reasonably early finish. I think six races is something of a record for a one day open at IBRSC, but you know, I think maybe we could have squeezed in a seventh! Here are the 'full' results. Nancy pretty much blitzes the fleet in results terms, but it was never easy. There were place changes on pretty much every lap of the day too. 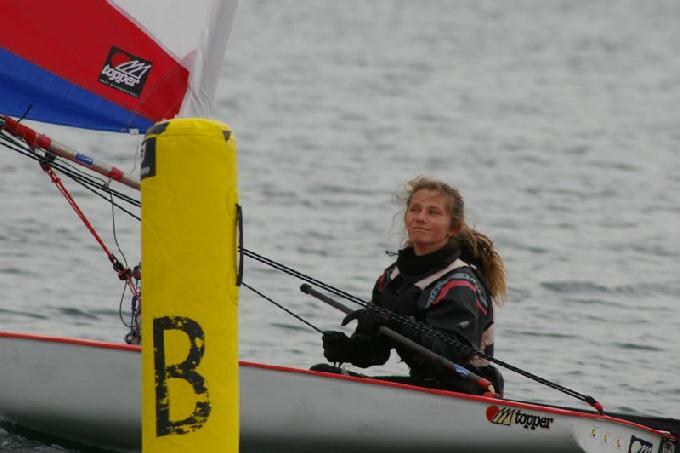 A special mention for Maisie Bristow - she was never going to keep up with the standard rig sailors with just the little 4.2 sail, but she was not intimidated on the startline and was fighting for her place on the front row: I was impressed. See if you like the sequence of shots of Clive Jackson and Lewis Humphries approaching the mark at the end of a run. Turns were done! It really was that sort of day with boats close together and in action with lots of space around - the first four were really very closely matched.. I know people rave about sailing in huge fleets, but personally I like the different challenge of sailing in small fleets with open space. Having said that twenty is more my idea of suitable small fleet racing, not five! If you'd like copies of photos I took from the event you can email me here, but my enthusiasm for trawling through 180 odd photos to email out a selection is not unlimited - a SAE and a USB stick/SD card with 500MB free coming to me in the post is my preferred route and you can have the whole lot, or for local sailors there are copies on the club laptop.